Studio(s): Breaking In Pictures, Will Packer Productions, Universal Pictures. Cast: Gabrielle Union (Shaun Russell), Billy Burke (Eddie), Jason George (Justin Russell), Richard Cabral (Duncan), Ajiona Alexus (Jasmine Russell), Levi Meaden (Sam), Seth Carr (Glover Russell), Mark Furze (Peter). 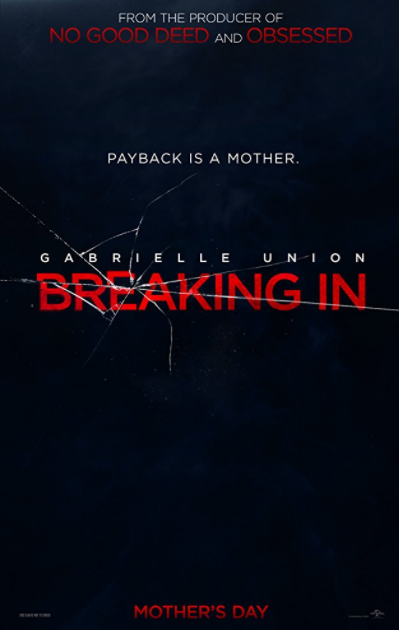 Story: Gabrielle Union stars as a woman who will stop at nothing to rescue her two children being held hostage in a house designed with impenetrable security. No trap, no trick and especially no man inside can match a mother with a mission when she is determined on Breaking In. Source: Breakinginmovie.com. This entry was posted in Upcoming Films and tagged Gabrielle Union by blackcinemaconnection. Bookmark the permalink.